Actually, this is my 16 year old, wearing his brother's Meathead hat. Meathead is a very cool pattern, written by Larissa. She graciously sent me the pattern, because son #2 who is prepared to leave home for the frosty Northeast in a few weeks really needed a hat, and of the thousands and thousands in Ravelry, this is the only one he would say he liked. I'm really grateful to Larissa. Not only did she send me the pattern, it was a great pattern to knit. I sat down and cast on when the Daily Show rerun from last night came on at 7:00 tonight. And, I finished it right as tonight's Colbert Report finished at 11. In between, Ollie and I watched Spiderman 2, and I've got this cool hat to show for it! The pattern is easy to follow and knits up without any trouble, unless you count the fact that Harry & Hermione pulled it off the needles while I was up getting bowls of blueberries for small children and I lost about eight rows. So, this is one of the many joys of Ravelry. You've got some yarn. In this case, I had Rowan's RYC Soft Tweed. I looked around to see what hats other people had made with it, and came upon this pattern. 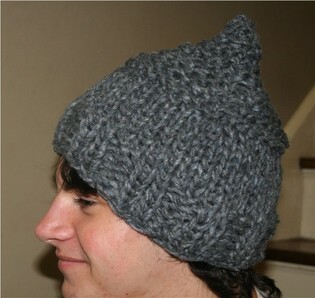 Two days later I had the pattern in hand and knit the hat. Who knew it could all be so simple? For those of you still waiting to get into Ravelry, it's definitely worth the wait! Now, I'm just hoping that Teddy will like the hat knit up as much as he liked the photo. And I'm really hoping it will help him take a long just a little bit of his Mama's love and protection when he goes off to school.